Are you looking for a family-friendly SUV that has excellent performance, advanced multimedia features, off-road capabilities, high-level safety and plenty of space for both people and cargo? 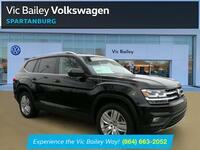 If so, you'll find the all-new Volkswagen Atlas to be an outstanding choice. See how the new Atlas measures up against one of its SUV competitors in this 2018 Volkswagen Atlas vs 2018 Pathfinder comparison. While both SUVs are fairly evenly matched for performance, the Atlas has the advantage of offering two engines (2.0L inline four-cylinder or 3.6L VR6), while the Pathfinder only offers the 3.5L V6. The powerful 3.6L VR6 in the Atlas is especially impressive, with its output of 276 horsepower and 266 lb-ft of torque. Performance in the Atlas is further aided by its smooth-riding strut-type front and multilink rear suspension, as well as the Electric Stability Control, which delivers excellent stability and confident handling. If you frequently encounter adverse weather conditions or are looking to head off-road, you can get the available 4Motion with Active Control all-wheel drive system. What really sets the Atlas apart from the Pathfinder is its roomy interior. While both SUVs offer seating for seven passengers, the Atlas boasts over 33.7 cu-ft more passenger volume than the Pathfinder (153.7 cu-ft vs 120 cu-ft). The Atlas is a great choice for loading up for long family trips with its abundance of cargo space. It has a maximum cargo volume of 96.8 cu-ft, compared to only 79.8 cu-ft for the Pathfinder. With the high-quality materials throughout the cabin and a choice of either the two-zone or three-zone climate control system, every journey is a comfortable one in the Atlas. And with the standard MIB II infotainment system and available Fender Premium Audio, you'll have no concerns about staying well-connected and entertained while on the road. Another strength of the 2018 Atlas is its abundance of safety features. Standard safety features include six airbags (including full-length curtain), Automatic Post-Collision Braking System and a rearview camera. With the upper-level Atlas trims, the rearview camera has dynamic guidelines. The new Atlas also offers a multitude of advanced driving assistance technologies, including Adaptive Cruise Control, Parking Steering Assistant, Forward Collision Warning, Lane Departure Warning and Autonomous Emergency Braking with Pedestrian Monitoring.